WASHINGTON (The Nil Admirari) - Earlier today, Republican presidential candidate and fired Hewlett-Packard CEO Carly Fiorina announced her desire to have the USS Ronald Reagan - a Nimitz-class supercarrier - as "a golden parachute" when Congress impeached her for gross incompetence as president. Fiorina also continued to hit back at her critics by claiming she could not be considered a failed CEO at HP due to the fact she walked away with about $21 million if she promised never to return. "My golden parachute from HP was over $20 million, which is a great deal considering I laid off something like 30,000 workers and was in charge when the company's stock tanked more than 40%," stated a smiling Fiorina, who had bounced at least fifty checks and borrowed money from dozens of staffers without paying them back just in September. Fiorina added, "After I am elected president, just imagine what I am going to have to do to be impeached and get my golden parachute from the government. It's going to cost a lot of jobs and money, and I'll insist on the USS Ronald Reagan if they want me to go quietly. I know some people who would totally buy that thing." RELATED: Fox News Trying to Prop Up Republican Candidate Carly Fiorina as "The Antihillary"
"Mrs. Fiorina seems to miss the point that you can be a horrible executive and still cash-in because people want you to leave before you do any more damage. That seems to be her thing. Well, that and not paying her bills or picking up the phone," replied Marcus Nichols, CEO of "Where's My Money?" collection agency. 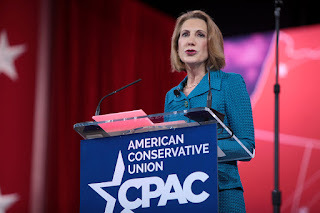 TNA was informed Fiorina had contracted with an independent appraisal company from China to board the USS Ronald Reagan and tell her how much it was worth. Estimates placed the value of the supercarrier at $4 billion minimum, which would make the USS Ronald Reagan Fiorina's largest golden parachute by far.